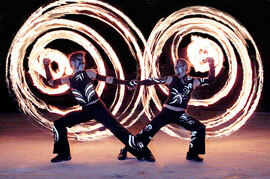 Established as one of the world's leading fire acts, the FlameOz Fire Show has been performed in over 28 countries across 5 continents. A high impact blend of beauty, dance, and raw energy, FlameOz combine perfectly choreographed feats of skill and artistry with powerful and explosive fire dancing, all set to a funky, emotive and climactic soundtrack. With up to 7 performers available, FlameOz take the audience on an unforgettable journey from a graceful and elegant opening, to a breath-taking and visually spectacular finale that will bring the audience to its feet. “The performers were beautiful, their skills were exceptional, the audience were spellbound during the entire performance"